It's that time of the year again! Amy is hosting the Blogger's Quilt Festival. If you're visiting here for the first time, welcome! This time I'm sharing a quilt that I just completed yesterday-- my Autumn Jewels quilt. I've written some progress posts here and here. The solid fabrics are Oakshott shot cottons, which are so dreamy to work with. This particular grouping is from the Autumn Colour Pack. The "neutrals" in the background are a mix of prints that I had in my stash. I bound the quilt in leather Essex cotton/linen yarn dye. It measures out to 52 x 56 inches. When I first started making this quilt, I was trying to do something different than what I am normally drawn to-- improvisational piecing. Cutting all of the triangles and half rectangles was a lesson in patience. But I'm so glad I decided to give it a try. This was a really fun quilt to complete! Just in time, as the last day of school was yesterday too! Have a great weekend. And don't forget to check out the other quilts in the festival! What a great crisp fall-looking quilt! What a great quilt. I love all the fabric you used, it goes so well with this pattern. Really pretty! I already admired a part of the quilt in flickr. It’s totally stunning! The way you quilted this is just awesome! It really contributes to the diamonds pattern. oh this is really cool! Love the backgrounds you chose - very striking. And I agree - the quilting is really nice. What a great finish! Stunning!! I absolutely love this quilt! This is so beautiful. I love everything about it but especially the quilting. Great job! very pretty! your choice of colors is impeccable! Such a lovely quilt, love the use of text prints! This is a wonderful quilt! This is an amazing quilt. I love the color palette and the background fabrics. I love this quilt. I especially love how you had something interesting going on in the negative space. I love quilts that have something more to show you as you get closer tyo them. Quilted perfection - I absolutely totally and utterly adore this quilt and TBH I have an autumn F8 stack and wasn't sure what to do with it but maybe now I know! I think this one is one of the best I have seen - and that's saying a lot! I love it!! 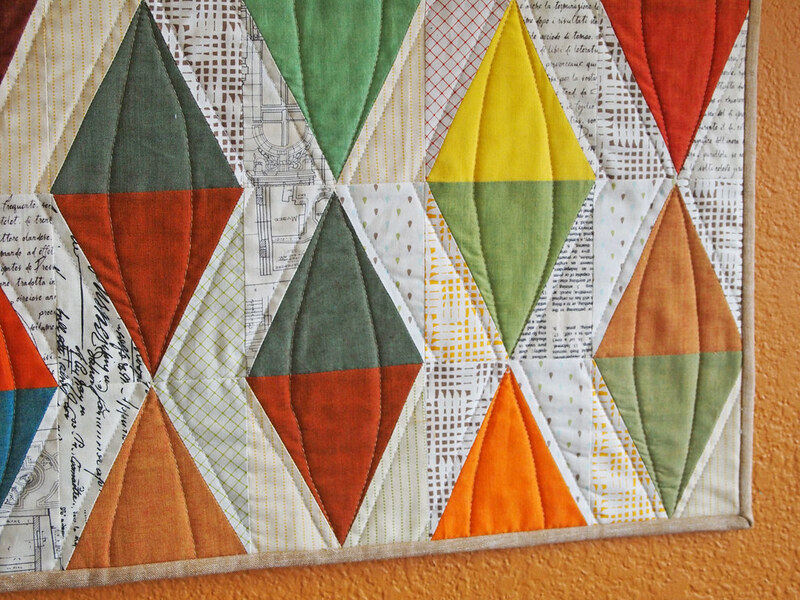 I love how you quilted the middle of the triangles, too! WOW Krista. Wow! I always love your quilts, but this one is a new favorite I think. Every decision you made along the way was just genius! It has a lovely warm and cozy feel to it, love it! It turned out beautifully and I love how you finished off the quilting. Thank goodness for that gorgeous wall that your quilts look amazing on!! I still can't believe your kids are finished school already. We still have 6 weeks to go! You made a great choice for the quilting. It looks lovely there! Love the quilt....colour, quilting the whole thing. This has finished up to be such a beautiful quilt! I love the details, especially the quilting. Thank you for sharing it. Oh, it looks so good all finished! 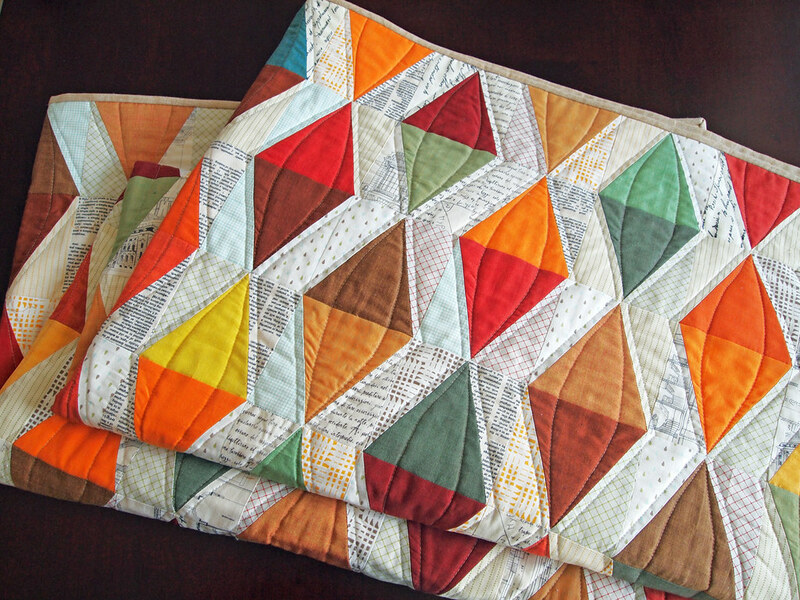 Love the way you quilted it -and just in time! Your quilt is beautiful!! I love it!! 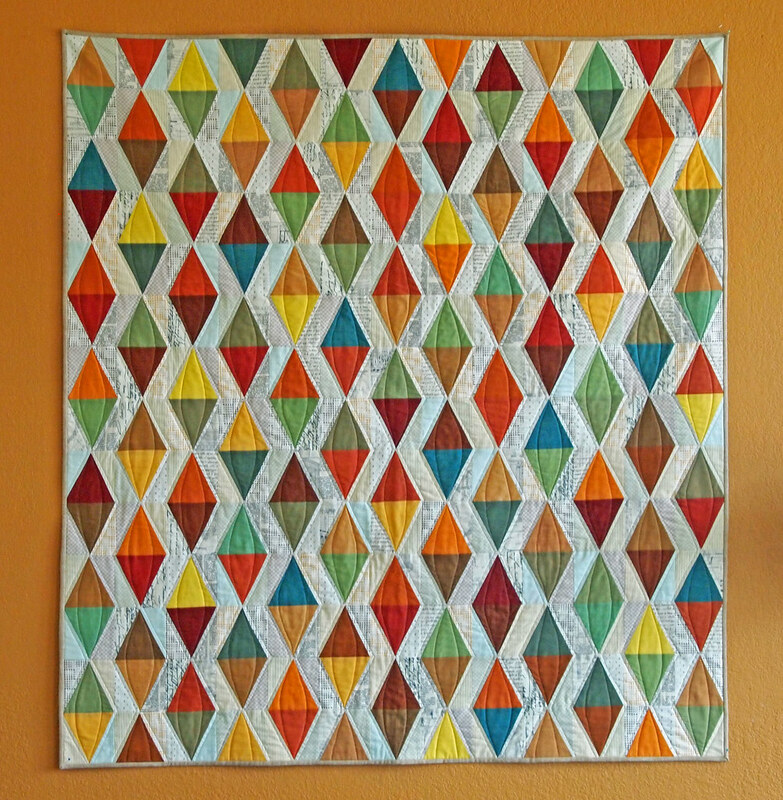 I love how this quilt turned out, Krista. I drool over this quilt every time I see it. Wonderful. Beautiful! Hope you bring it on Monday. That quilt is BEAUTIFUL! I really love the colours and the design! Super! My favorite! Whoa!!! This is amazing. I love how The sashing isn't completely white. So beautiful! love, love, love the shot cottons! Krista it turned out so wonderful!!! The quilting turned out perfect!!!!!! One of my favorite quilts of the festival and possibly ever! The scrappy mixed up neutral background is truly genius and so well done. Krista this quilt is so beautiful and I LOVE the way you quilted it! Stunning!! Gorgeous quilt. Beautiful warm colors. I'm pretty sure you've heard by now, but this quilt is just amazing! This is one fabulous quilt! Wow. I love the fabrics you used. Love the bright shot cottons mixed with the neutral prints! This quilt is a real stunner! What a great way to mix interesting solids with those little neutral prints. The quilting suits the modern feel of the quilt too. I really enjoyed this post. So pretty! I love the use of color. It's such a vibrant quilt. Great job! oh my goodness - it's lovely! The use of color and the different borders is fabulous! I've been excited to see this finish, Krista - it is amazing! Beautiful, beautiful work as usual. What amazing work on a wonderful finish! Your quilt is beautiful. Absolutely stunning! I love your choice of neutral prints, the solids look great against them. Oh, I love this! Your choice of fabrics is spot on. Love the colours and I think the quilting just makes it special. I've been bopping around the Festival and I keep coming back to this quilt - I love what you did with it! 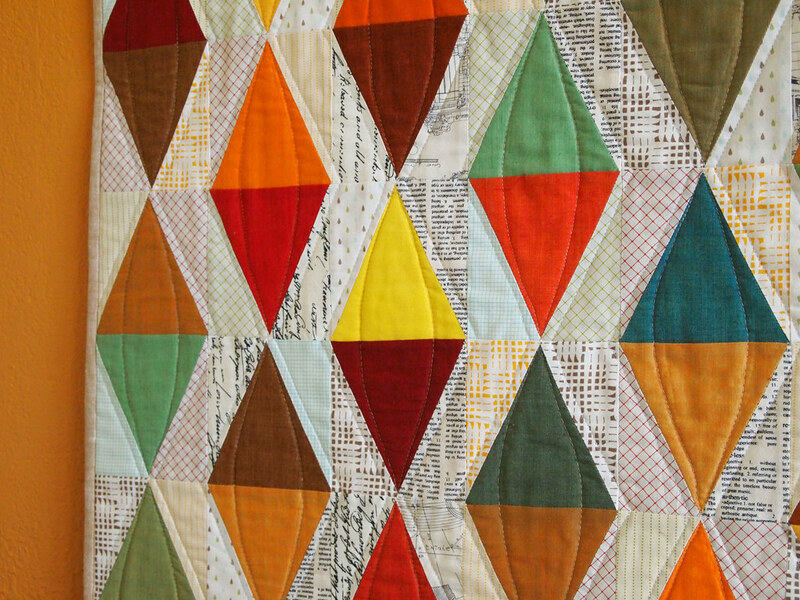 The colors, the piecing, and especially the quilting make it a very special piece - thanks for sharing it with us! looks great! I love how you quilted the diamonds. It really gives them a 3D look. Very cool pattern. The first thing I thought of when I saw it was hot air balloons. I might try it with a blue background for a fun kid's quilt. oh wow, are you going to sell this? it's gorgeous!! !